We are not history experts or even buffs by any means but like our guests, we were so taken in by the obvious historical elements of our beloved manor that we just had to dig a little deeper to truly absorb all that we knew this magical place had to share. And so we dug. First and most logically, we dug into the property records of Carroll County and not to our surprise we found the manor we see today had a property record dating back to 1903. But there was much more we learned about this old, wonderful, vintage place. In 1842, the earliest record we could find on the property was made; identifying a structured log cabin and small barn being built at 543 (trail rd 5) which we discovered was later known as 111 Springdale Ave., our manor's address. The cabin was noted for receipt of parcels along the route that would one day become part of the civil war trail. Its convenient position exposed it to travelers from both the North and the South and even welcomed travelers who stopped for its mineral springs located all around the then, multiple acre property. In the 1800's, Confederate Gen. Bradley Johnson's 1,500 cavalry, detached from their command and moved in on the town of New Windsor as the Battle of Monocacy began just south of Frederick. The Southern troopers ransacked businesses in this small town before they moved onward but it is believed that this activity left behind a widow who had accompanied the troops during their advance. It is believed that she fell in love with the location and took ownership of the property later the same year. In an effort to make the property hers, the woman had the manor we know today built around the log cabin. When on your tour or here for your visit, you will likely have an opportunity to see a carved out piece of this history in the closet of our "Poe" guest bedroom, but if we cannot show you the Poe, you can take notice of the thick walls and window sills, doorways and thresholds where it is evident something more than stories exists behind these walls! As it sits today, Magnolia Manor and New Windsor are as inviting as they were in their earliest days during and after our country's battles for self governance. We have endured ransacking as mentioned already but also have been honored by the campaign of Theodore Roosevelt during his run against Taft and proudly hosting the home of Simon Murdock, a black civil war veteran who settled in New Windsor and is credited with holding Sunday School meetings in his private residence for African American children during an era of great challenge and growth. Guests of today will enjoy the subtle hints of yesteryear as they walk our grounds where a mineral spring remains today. Crossing original brick walkways preserved from the late 1800's as well as taking in nature at this hidden and unsuspectingly private getaway serves as just an early indicator of the rich history this manor holds. Think of the story you've just read as you stand in the threshold of our Tea Room and notice the deep framework of the windows and doorways that encase the early 1800's log cabin that still remains behind our walls. We do hope you will enjoy the original glass windows we have painstakingly worked to preserve, our vintage doors, 1860's original wooden banister and hardwood floors as well as the inherent slopes, slants, nooks, crannies and creeks of this amazing manor house that welcomes every guest with its own serenity. The sleep is amazing here and the views are genuinely astounding; especially at sunset. Come take a step back in time and let the hours slip away. We truly look forward to having you here. During the summer of 1863, the town of New Windsor experienced the advance of Union Cavalrymen as they rode through the town on their way to the battle of Gettysburg, PA. The history of their travels can be explored through a tour of many local spots between our Manor and the Battlefields of Gettysburg; a short but beautiful country drive of 23 miles away. The following summer, the town fell to the Confederates and New Windsor began taking on the architecture of the new confederate influence while maintaining its original heritage. 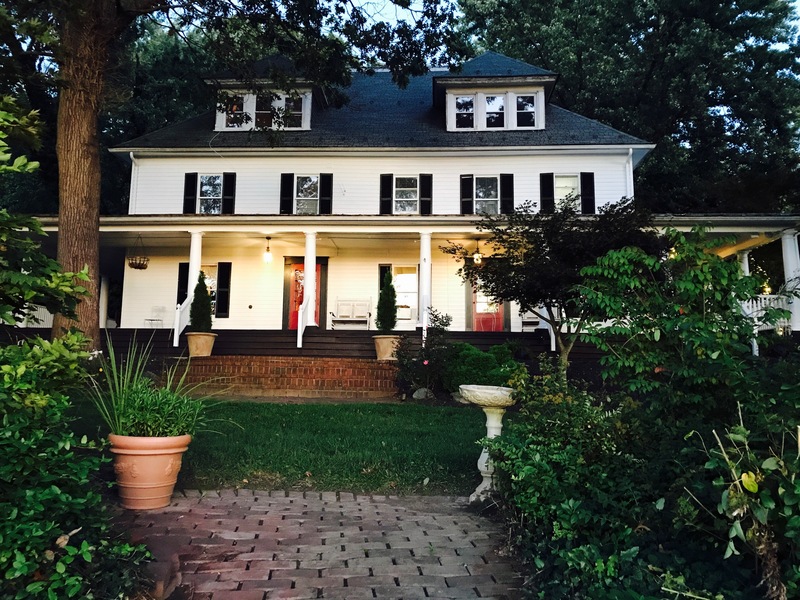 Homes began to emerge representing both the classic and colonial revival styles like our own Magnolia Manor; as well as a few more ornate, Queen Anne style homes. 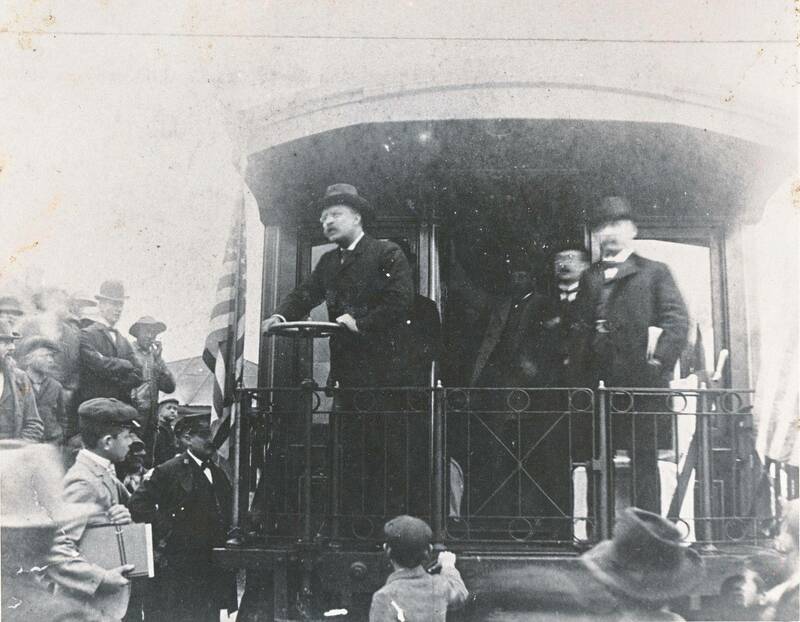 The photo above shows a visit to New Windsor by then former, but campaigning, President Teddy Roosevelt in 1912. 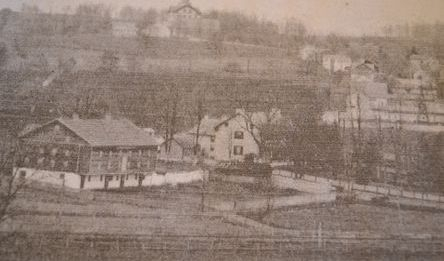 The photo below represents the town of New Windsor in the 1800's. Photo Credits: Unknown.